Students get their first look at the season game field for DESTINATION: DEEP SPACE Presented By The Boeing Company during the 2019 FIRST Robotics Competition Kickoff powered by Rockwell Automation in Manchester, N.H.
Italian electric motorcycle manufacturer, Energica Motor Company, ha signed a commercial agreement with Hudson Valley Motorcycles in the market of New York State and the Northeast region. According to Plug-In America, New York is the second largest market for EV vehicles, with a growth rate of 67 percent (or 30,645 registered vehicles) in the past year. Energica is drawn to the region by New York Governor Anthony Cuomo's plans to add 10,000 additional charging station. New Hampshire Gov. 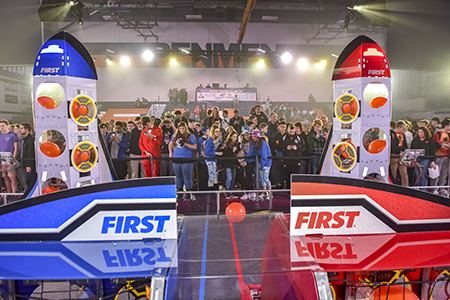 Chris Sununu, U.S. Rep. Chris Pappas (D-NH) and inventor Dean Kamen encouraged students to work together and share ideas to advance the world through technology and innovation at the 2019 FIRST Robotics Competition season kickoff. The new robotics game, DESTINATION: DEEP SPACE, requires teams to collect samples on Planet Primus. Working with adult mentors, students have limited time to design, build, program, and test their robots to meet the season’s engineering challenge. Once these young inventors build a robot, their teams will participate in one or more of the global 173 Regional and District events that measure the effectiveness of each robot, the power of collaboration, and the determination of students. The event is being sponsored by The Boeing Company and Rockwell Automation. The Royal Swedish Academy of Sciences has elected ocean mapping pioneer Larry Mayer, director of UNH’s Center for Coastal and Ocean Mapping, as a foreign member. Mayer is among 175 foreign members of the Royal Swedish Academy, best known for granting the Nobel Prize. The lifelong appointment recognizes successful achievements in research or services to science. Mayer will serve within the Academy’s Class for Geosciences, one of ten subject categories that represent the members’ scientific expertise. For more information, click here. Wheeler Ruml, a professor of computer science at the University of New Hampshire, has been named a Fellow of the National Academy of Inventors. Ruml, whose research in artificial intelligence has led to 17 U.S. and 12 foreign patents, joins the NAI 2018 class of 148 Fellows. Ruml is currently collaborating with C3I, an Exeter-based company specializing in marine communications, controls and instruments, and he has worked with UNHInnovation to file a patent application related to helping self-driving cars make safe “decisions.” To read more, click here. New Hampshire Humanities will host its next Ideas on Tap on artificial intelligence. The talk regarding the ethical challenges surrounding artificial intelligence and machine learning, weighing the risk and benefits, will take place at Stark Brewing Company in Manchester on Tuesday, Jan. 29, from 5:30 to 7:30 p.m.